The Ferro Pavilion, where Music by the Lake performances are held, offers sheltered and unsheltered seating. It’s time for the sounds of summer to hit the shores of Lake Geneva. For the past 15 years, those sounds have included the rhythms of big-name acts like The Ramsey Lewis Trio, Kenny Loggins and the Beach Boys, all playing at the Music by the Lake summer showcase, hosted by Aurora University at George Williams College (GWC) in Williams Bay, Wis.
Music by the Lake hosts summer performances at the college’s Ferro Pavilion, which is located right on the lakeshore. 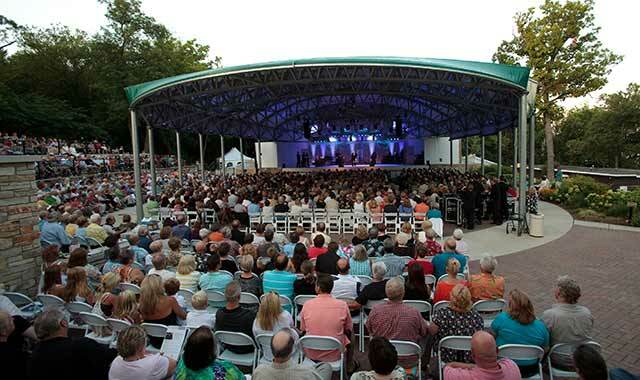 Much like Chicago’s Ravinia, this intimate venue provides a variety of seating under shelter and on the lawn. An additional section of seating, unprotected by a shelter, lies between the stage and the lawn. Saturday performances begin at 7:30 p.m., Sundays performances at 4 p.m.
“I know there are a lot of music fests everywhere you go, but this one is a more intimate family environment, where people can enjoy a concert right on the shores of Geneva Lake,” says Russe. The classic sounds continue on July 12 when jazz guitarist, singer and bandleader John Pizzarelli brings his quartet and their unique sound to the stage. Best known for cool jazz, Pizzarelli performs a variety of classic pop, jazz and swing tunes. His sound echoes Nat “King” Cole. Pizzarelli has performed with many modern legends as well, including Sir Paul McCartney, James Taylor and Natalie Cole. For as much as this year’s lineup includes classical acts, it also pays tribute to popular chart-toppers. First up, Waukesha, Wis., natives BoDeans appear on July 18. The group best known for tunes such as “Closer to Free,” “Idaho,” and “Fadeaway” just released its 12th album this spring. Its tours have put it on stage with artists including U2, Bob Dylan, Paul Simon, Tom Petty and David Bowie. Parents and children especially will enjoy this year’s family feature on July 26. Returning to the stage is Doktor Kaboom, a fun-loving scientist whose one-man interactive show makes science and math fun and approachable for youngsters. The mostly improvisational show means no two appearances are ever quite the same, as he uses scientific discovery and comedy to wow audiences and draw them into scientific principles. Tickets sell out fast for these shows, and this year, they’re likely to sell even faster, as lawn seating is adjusted to improve the viewing experience. Whereas the typical show offers nearly 2,300 seats, this year’s concerts are likely to hold just 1,800. Because dining options on the GWC campus are fairly limited, many visitors bring their own picnic dinners. Guests sitting on the lawn set up well before the show, enjoying their picnic with lawn chairs, blankets and small roll-up tables. A la carte items are sold inside The College Inn and for a classy picnic, guests can advance-order a ready-made basket of food and supplies from the college’s Dining Club, located in the Beasley Center. For the second year now, concession stands will be set up close to the pavilion, and will serve a variety of picnic food such as popcorn, lemonade, hamburgers, hot dogs and brats. This year brings a longer season for Music by the Lake, with the launch of a concert series that runs through the school year. The new Sundays at Four series delivers a combination of classical music performances and educational lectures on Sunday afternoons. Recent events included the music of George Gershwin, a lecture on Marie Curie, and a talk by Fabien Cousteau, grandson of ocean explorer Jacques. This fall, expect a talk by political commentator David Brooks in September and classical music performances in October and November. Nearly 10,000 people are expected to visit this year’s outdoor performances, come rain or shine. For many, it’s a chance to enjoy a night of music on the lakeshore with friends and family. For others, it’s a chance to enjoy quality music without the traffic. Sunday, July 12, 4 p.m.
Doktor Kaboom: Look out! Science is Coming! Sunday, July 26, 4 p.m.
Saturday, Aug. 1, 7:30 p.m.
Saturday, Aug. 8, 7:30 p.m. This entry was posted on Thursday, June 18th, 2015 at 11:59 am	and is filed under Arts & Entertainment. You can follow any responses to this entry through the RSS 2.0 feed. Both comments and pings are currently closed.